We make what you want! 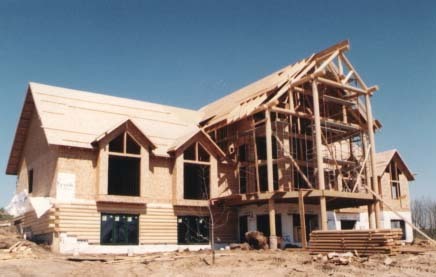 The construction of each home by New Homestead USA is as exceptional as you are. We offer a wide selection of solutions individually customized to fit your demands and expectations. You are assured of the best value, offering the freedom and flexibility of custom packaging. Whether you simply purchase wall logs or a complete materials package, we do all we can to make your dream of a log home an affordable reality. 1.) New Homestead USA is owned by local distributors. This allows the customer to purchase factory direct at a lower price. You receive local service, giving you the advantage of better communicating your wants and needs. 2.) New Homestead USA has a greater selection of log home components than any other manufacturer in the business. You have flexibility in achieving the design of your dreams and all of the components are grouped with one supplier. 3.) New Homestead USA has a product line that can be adapted to fit any floor plan. Your custom designed plan can be bid in the log style, product grade and wood species you desire. 4.) New Homestead USA offers kiln dried, air dried, dead standing and green products. Each is offered in a structural and in-house facial grade. Your local distributor will assist in your selection of product to best suit your budget, taste and climate. 5.) Your New Homestead USA distributor offers design, blueprinting and engineering assistance to secure your approved plans for construction. 6.) Materials manufactured for New Homestead USA are warranted to meet specifications or the product is replaced prior to being put into the building. 7.) New Homestead USA wants their customers to have the best log home in the industry for the investment. This is the reason we offer different grades of product and the flexibility to fit your needs. 8.) New Homestead USA produces materials for projects of all sizes and ships anywhere in the world. New Homestead USA is a distributor owned company, capable of producing all of your log home building needs. A local, professional builder will listen to your dreams and help you design a home to fit your personality, lifestyle and budget. Every single person in our staff takes a lot of satisfaction in his work and values the relationships we've created with our customers. We actually love what we do and hope to make your dream of owning a log home a simple and stress free process.